Do-it-yourself types are always looking for ways to make planters, and why not? They can be used inside or outdoors, personalized to any decor, and make great gifts. The "Rocky Bucket" from Kate Riley at Centsational Girl is a do-it-yourself project that turns a metal bucket into a beautiful, natural-looking planter with a "crazy cool texture." The key to success on this project is to use a very sturdy metal bucket. "If you use a flimsy container the project just won't work," Riley advises. "It definitely needs to be a bucket that holds its shape or you risk cracking mortar and grout." 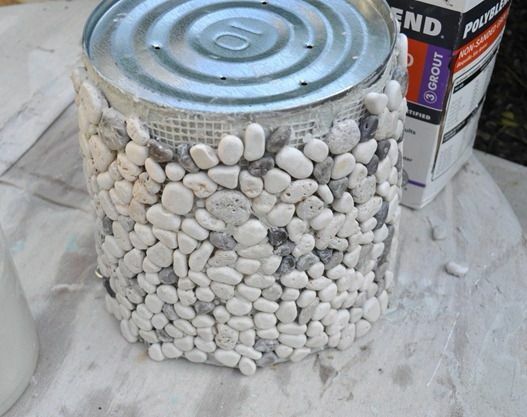 To make Riley's Rocky Bucket, you'll need thin-set mortar, river rock mesh, grout, and a sturdy metal bucket. You will also need a putty knife and a sponge. To attach the rocks to the bucket, Riley applied the mortar and mesh in sections. After drying, she applied the grout and wiped away the excess with a sponge. Riley's step-by-step photos and instructions, along with helpful hints, can be found on her blog post at Centsational Girl. 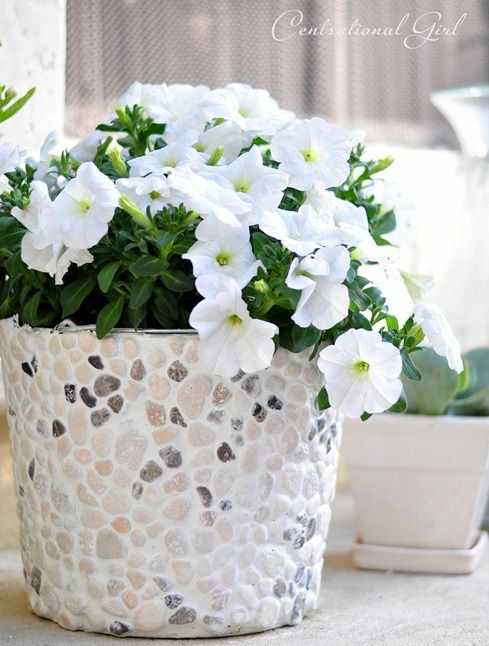 Plastic buckets are also popular containers for plants; entire container gardens have been built from them! 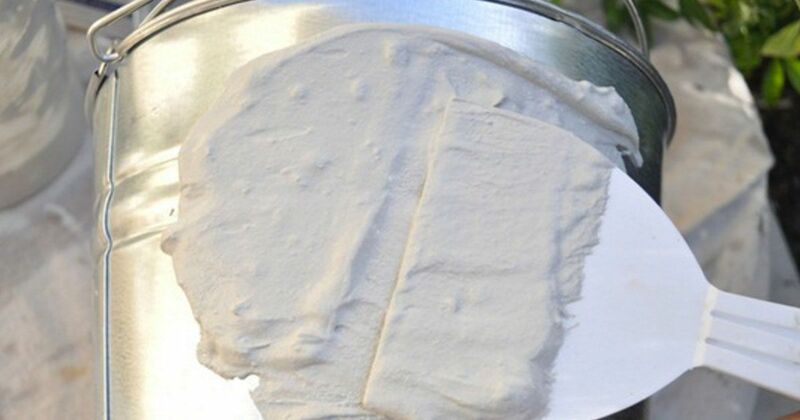 They aren't terribly attractive, however, so you could try duplicating Riley's river rock method on them, although the plastic will require a different kind of adhesive. Other folks have covered plastic buckets with coffee sacks for a rustic look, or with bright fabrics to coordinate with indoor decor. A decorated bucket also makes perfect storage for kids' toys, shoes, or crafting supplies. Riley suggests putting the Rocky Bucket into the bathroom as beautiful storage for toiletries or towels. 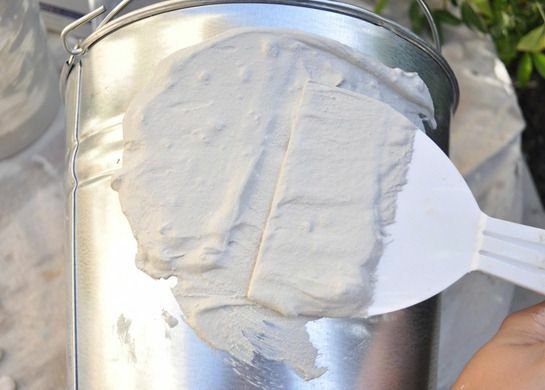 There's no end to the uses that can be found for the metal or plastic buckets you may already have on hand in your home; the ones we've suggested here are... just drops in the bucket! Please share this article, and tell us in the comments how you've decorated your buckets and what you've done with them!